Mito (水戸) is located in the middle part of Ibaraki Prefecture. It is very popular for the city of Mito Komon. Mito Komon is the most popular Samurai Show in Japan. It is the fiction story based on the real samurai. The main Character, Mito Komon Mitsukuni (水戸黄門光国), was the grandson of Tokugawa Ieyasu, and Daimyo of Mito. He was also the Vice Shogun. 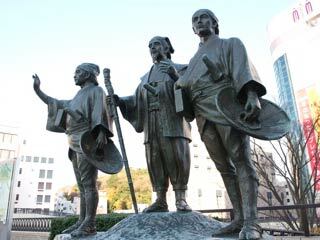 His servant Samurai, Suke-san and Kaku-san are also the based on the real person. In Mito, there are many historical ruins of Mito Castle and Mito Komon. Also, the last Shogun was born here and studied at Kodokan which is located right next to Mito Castle. Mito is also very famous for Natto. Many of ruins are located near by Mito Station. Mito is the city related with Mito Komon (Tokugawa Mitsukuni). There are many ruins of Mito Tokugawa, especially Kairakuen Garden and Kodokan. Kairakuen-garden is the one of the three major gardens of Japan. Kairakuen garden was built by Tokugawa Nariaki (Father of Tokugawa Yoshinobu). It was open for all samurai of Kodokan and mito civilians. Kodokan is the school built in late Edo Period. It was the largest school at that time and last Shogun, Tokugawa Yoshinobu studied at Kodokan. Mito is also very famous for Natto. There are many Natto factories.